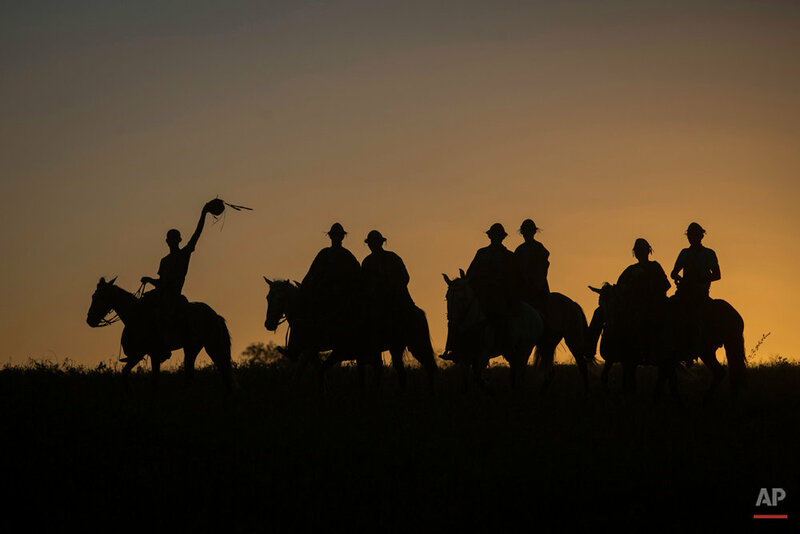 The men appear on horseback at daybreak, emerging from the thorny thicket of shrubs and small trees that mark the semiarid landscape of the northeastern Brazilian state of Pernambuco. 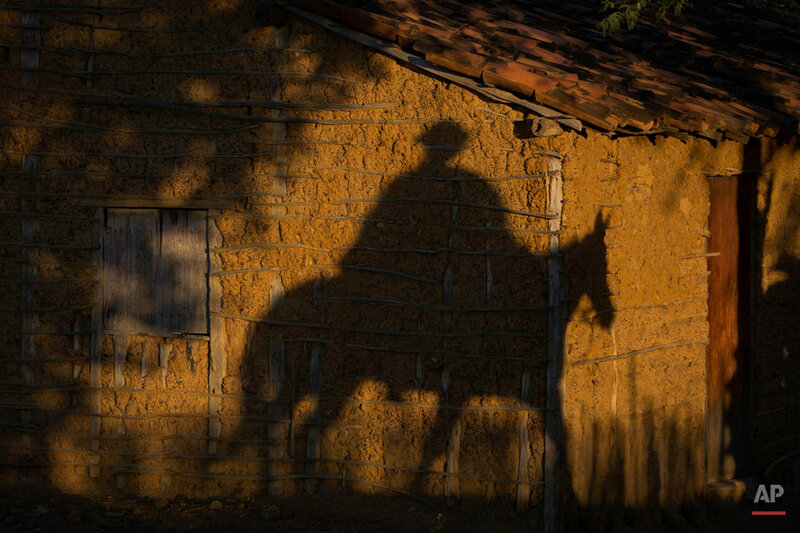 The 200 or so cowboys known in Portuguese as "vaqueiros" are clad head-to-toe in traditional garb called "gibao." The protective leather clothing consists of elaborately stitched chaps, jackets, hats and hand coverings decorated with bits of orange, red and blue that they have donned for the annual festival known as "Pega de Boi," or "Catch the Bull." Most of the "vaqueiros" make the special clothing themselves. Those who cannot, buy their outfits from local artisans for about $200. 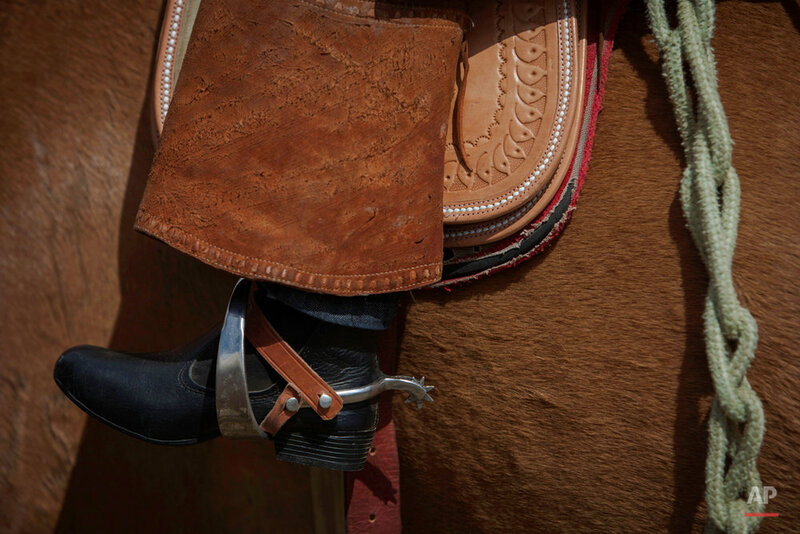 The cowboys sit on small leather saddles, their boots slipped inside the stirrups, and occasionally take a sip of cachaca, a distilled spirt made from sugarcane juice, out of a bull's horn. Women never participate in the event, and at this particular competition there aren't even any female spectators. Hundreds of bulls supplied by local ranchers have been herded into a corral where they wait to be let loose into the shrub-dotted terrain. "May the fastest win," an announcer shouts over a loudspeaker, and the annual competition begins. 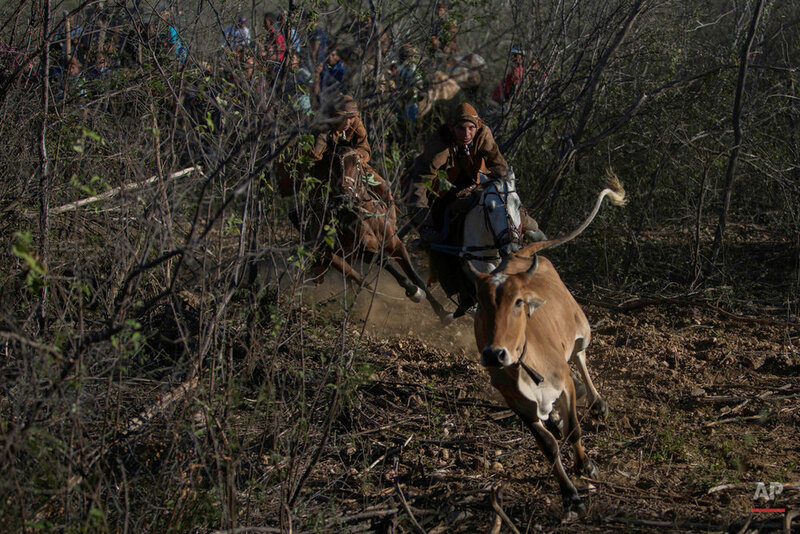 The gate swings open and the first bull rushes out into the shrub land, known as the "caatinga," and a team of two cowboys gives chase. The two grasp the bull's tail, knock the animal down, and grab a leather necklace that was earlier placed over its head. They then deliver the necklace to the judge as fast as they can. The exercise is repeated with other bulls and teams, each timed to determine which "vaqueiros" are the fastest. After the winners are declared, the bulls are allowed to roam freely until the following day when they are rounded up and returned to their owners. Joao de Cazuza, 56, recalls how his father and grandfather introduced him to the event when he was a young boy. They would take more than four days herding bulls through the bush just to get to the festival. He says that he was just 15 when he donned his first "gibao," and "from that moment on I knew I was a 'vaqueiro.'" 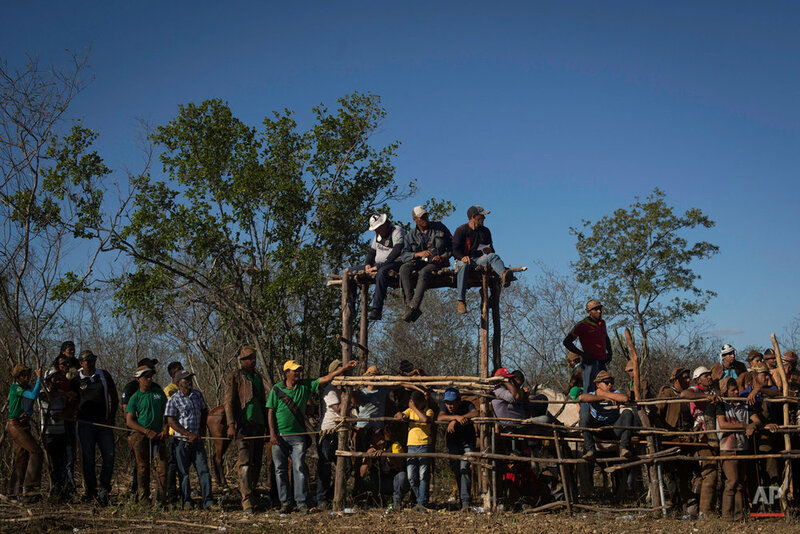 Deda Carvalho, who is 54, works inside the corral preparing the bulls to be set loose into the "caatinga." 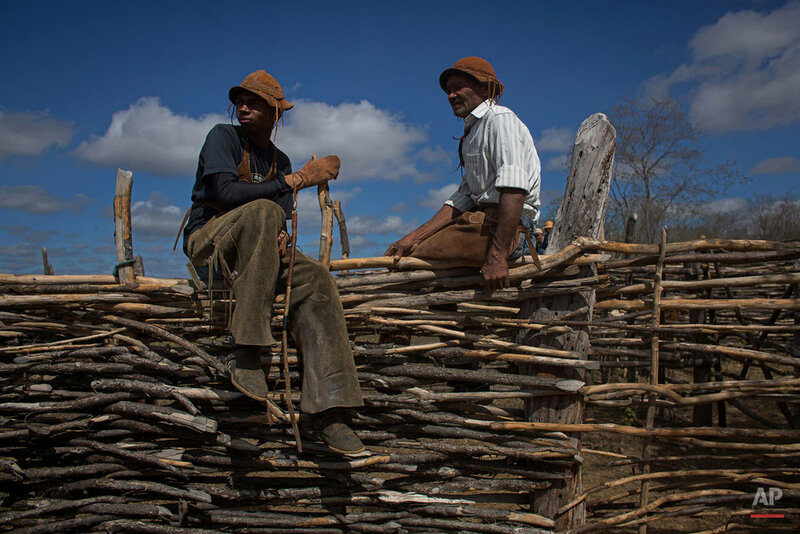 Later, he sits on a corral fence made of tree branches with his 19-year-old son, Thiago, who he says is now a "real cowboy" as well. Thiago Carvalho says this is all he has ever wanted. "I grew up listening to the cowboy stories of my father and uncles," says the younger Carvalho. "I am proud to be a 'vaqueiro.'" Text from the AP new story, AP PHOTOS: Brazilian cowboys take on bulls in unique rodeo.